One of the most misunderstood concepts in the restaurant industry is the concept of value. 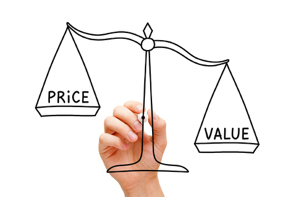 Far too many leaders in the business equate value with price. And to be fair, so do many guests. We see restaurants constantly pursuing “value strategies” where they discount price heavily and then wonder why their sales popped up a little, they made no money, and over time the sales wane. The answer, of course, is that value is really more a function of guest experience than price. So long as the food/service/facilities (including online) elements that make up experience support it, the price you charge is almost secondary. Naturally, a lot depends on the segment you compete in. Fine dining has one price tier they can work with, QSR is a different thing as is Casual Dining. But within those segments you compete with your competition for value perception to win business. Recently, QSR concept Jack-in-the-Box issued a statement concluding that “chasing value is unsustainable.” This came after a heavy discount strategy was executed and sales continued to be negative. If you are “chasing value” and that means to you that prices have to be discounted and that’s your strategy, it is unsustainable because competitors can easily counter price. But if you “chase value” by investing in and upgrading the guest experience in a meaningful way, you will win more business and it is much harder for competitors to counter that. Chris Petersen is CEO of On Brand Media, which provides Brand, Marketing and Management Solutions to various businesses with specialty in restaurants. He can be reached at chris@onbrandmedia.com. For more information visit www.onbrandmedia.com. next post: On Brand Media Acquires Liebeck-Morris, Inc.